For certain types of job occupations such as drafting or sewing, particular varieties of shears & cutting scissors are required to make clean and precise cuts. No matter whether someone is buying these important tools for everyday office use or specialized tasks, it is important to understand a few tips. 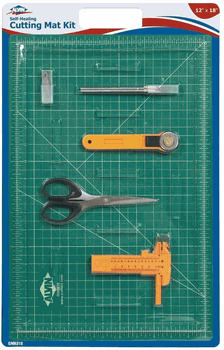 Cutting tools are available in an assortment of blade sizes to fit nicely in small or large hands. A longer blade on shears helps with completing a task such as cutting paper or cardboard faster, but these shears are often cumbersome to hold and use. Alternatively, small scissors can make it difficult to cut large sheets of thick vellum or poster board. Budget priced cutting tools are typically made of inexpensive but durable stainless steel with a chip-resistant plastic covered handle that is comfortable to hold. The plastic handles are often made in different colors to match an office’s décor. These types of cutting tools are made in lightweight styles that are easy to carry. A shopper may want to opt for a better quality and higher priced cutting tool made with nearly unbreakable handles. Artists or drafters wanting to cut thick plastic or canvas will prefer versatile scissors with a built-in bottle opener and handles designed for left- or right-handed people. Specialty shears are also available with corrosion resistant titanium blades with an adjustable tension screw. There are specialty features to consider when buying shears & cutting scissors. Some of the features available include having straight or angled handles. When someone is cutting items on top of a table or desk surface, a slanted handle is appropriate. Straight blades work nicely for cutting small items held in the user’s hands. To avoid needing to sharpen manually the blades on scissors, many shoppers want self-sharpening blades. Keeping cutting tools clean by removing glue and paint makes the devices last longer, and it is possible to buy shears that are dishwasher safe.